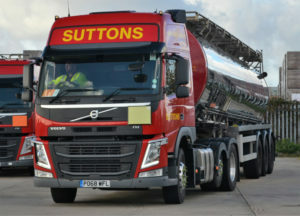 Tanker specialists Suttons produced an operating profit of £4.4 million last year, against an operating loss of £2.6 million the year before. Turnover in the year to 20th April 2018 was £170m, down from £182m the year before. The annual results for parent group Thomas Cradley Holdings said this was down to the full year effect of lost contracts and exchange rate movements, offset by new business wins. Last year saw a number of strategic initiative in the first year of a five year plan, including a significant increase in capital expenditure, development of new management information systems, and strengthening of the management team. The UK tankers division “continued to evolve its operating model to reflect changes in its customer base and the nature of some of its contracts leading to further efficiency improvement, additional new business and margin improvement”. It took delivery of 132 new tractor units and placed orders for a further 72 to be delivered next year. The company plans to update 206 road barrels over the next four years improving payloads and increasing flexibility. Suttons International division benefits from some improvement in underlying market conditions towards the end of the year.